When employing any type of tradesmen a binding contract is essential in order that the employer can fully control the work being undertaken. Although many tradesmen will give simple quotes and verbal agreements it is a wise move to have all of the terms and conditions laid out before the job begins. Control is one of the main reasons why a contract between employer and tradesmen is vital. Employers cannot take anything for granted regarding their expectations and requirements of a job. In many cases if a specification was not agreed before the job began then the employer cannot simply take it for granted that their exact requirements are part of the job. For example, a simple job in an employer's home may be to knock down a wall between two rooms. If the removal of debris after the wall is removed is not written into a contract then the tradesman is under no obligation to dispose of the debris. It is a wise move to agree either verbally or in writing the exact requirements before any work commences. Verbal agreements are legally binding contracts but in today's world there are many shoddy contractors waiting to do the minimum work for the most pay. Of course this is not to say that there are not reputable tradesmen who are conscientious and will do a perfect job for their wages. Reputable contractors will not have a problem with written contracts and will be more than happy to go through all the terms, conditions and expectations. Contracts protect both parties and if the terms have been agreed and written before hand then both parties will know exactly where they stand. A complete address for the tradesmen including phone numbers and email addresses if applicable. Payment details including any deposits or money need upfront for materials. Project length, commencement and completion dates. Material specifications to the employers exact requirements or clauses for substitute materials. Names of any subcontractors and guarantees that they will be paid before completion of the job. Details of any permits or council authorisation to commence the project. Warranties and guarantees should anything go wrong after the project is completed. Basic information on the makes and types of materials that will be used. An important clause in any contract between employer and tradesmen will be the cancellation clause. This should be included into the contract in order to give the employer time to decide whether they wish a job to commence or not. It is sometimes known as a cooling off period and gives a set cooling off period of time before the job commences in order to cancel the contract. Breaches of contract are major contract considerations when employing tradesmen. Breaches will occur if any of the terms and conditions of the contract are broken. This can be as simple as a tradesman substituting red pipes that have been specified for blue pipes. Although the blue pipes may work just as well they were not the colour specified by the employer and this could be seen as a minor breach of contract. Breaches of contract by either party can lead to legal disputes and this is another reason to have all terms and conditions laid out for future reference. If the project undertaken is one where large amounts of money is involved then it may be a wise move to have the contract looked over by a solicitor for any unclear terms and conditions. In many cases tradesmen will not expect to be paid upfront. However, many will require a deposit as an act of good faith or to buy certain material before the job begins. Always make sure that any monies exchanged are noted in the contract. Some tradesmen may ask for half of the money during the work and this should be reflected by the amount of work already completed. Never pay for the whole job before the work is completed. Paying for work as the job progresses means that if a contractor does disappear the employer can pay someone else to complete the project and not be out of pocket. 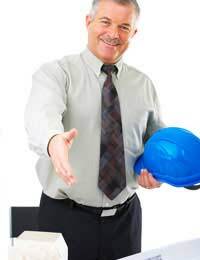 Contracts between employers and tradesmen are there for the protection of both parties. If a tradesman does have a problem with using written contracts with full terms and conditions then simply find another who will be willing to agree to a full contract. It is always better to be safe than sorry where money is concerned.